The "cycle of suspicion and discord" between the United States and the Muslim world must end, U.S. President Barack Obama said Thursday in Cairo, calling for an end to violent extremism and the advancement of peace in the Middle East. In a highly anticipated speech at Cairo University, Obama urged Muslims to enter with the United States into a "new beginning." The tensions between the U.S. and Muslims around the world are "rooted in historical forces that go beyond any current policy debate," Obama said. 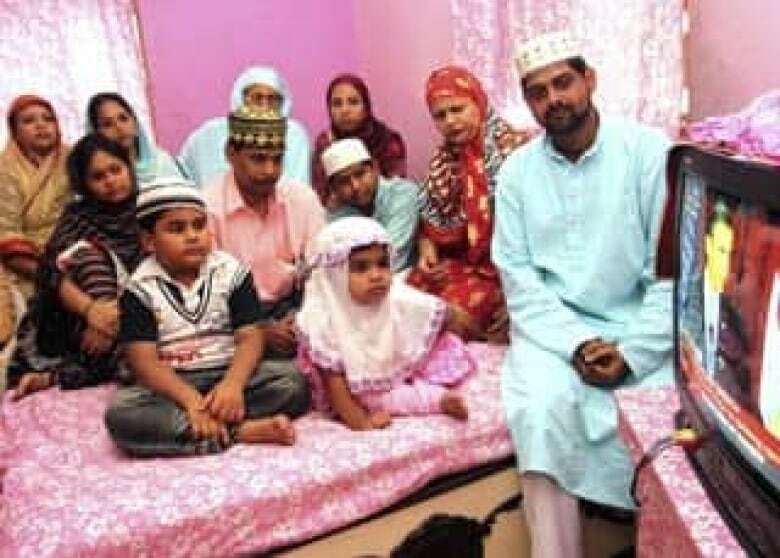 Islamist extremists and the Sept. 11, 2001, attacks on the U.S. have led some "to view Islam as inevitably hostile not only to America and Western countries, but also to human rights. This has bred more fear and mistrust," he said. "This cycle of suspicion and discord must end," he said. Obama is hoping to usher in a new era in U.S. relationships with the Islamic world and its estimated 1.5 billion Muslims. The 55-minute speech was directed at building mutual understanding but also bluntly urged Muslims to embrace democracy, women's rights and economic opportunity. Obama conceded that the United States does not know what is best for all countries and that "no system of government can or should be imposed upon one nation by another." But he added that he believes in democracy and equality for all people. The speech was interrupted by several series of loud applause and occasional shouts of "We love you." Obama has vowed to chart a new path in the U.S. relations with the Muslim world after policies under George W. Bush's administration had alienated allies in the Middle East. Obama acknowledged that a single speech wouldn't resolve the long-standing challenges in the region. But a way must be found to move forward in a constructive way, he said. Violent extremism must be confronted, said the president, who discussed the influence of the Sept. 11 attacks on the American psyche, the U.S. efforts in Afghanistan and the war in Iraq. But the United States is not at war with Islam, Obama said. "We will, however, relentlessly confront violent extremists who pose a grave threat to our security." Islam is not the problem, he said, "it is an important part of promoting peace." Many in the Muslim world had been waiting to hear from Obama regarding a Palestinian state. 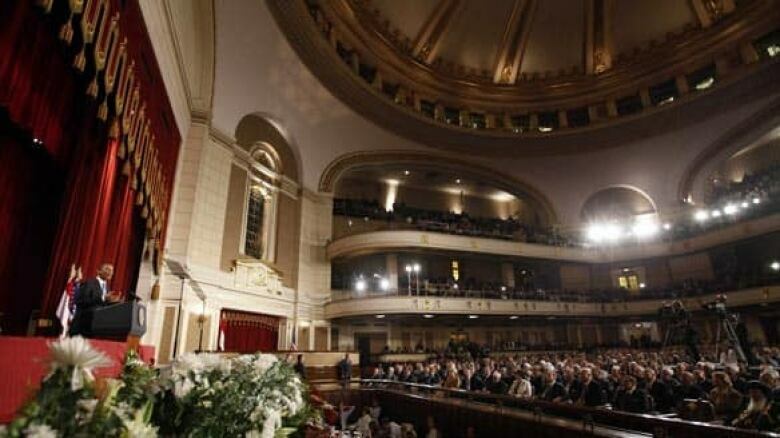 Speaking in a domed auditorium draped in red, Obama said U.S. ties with Israel are unbreakable. But the Jewish pursuit of a homeland has caused suffering for Palestinians, Muslims and Christians, he acknowledged. "They endure the daily humiliations — large and small — that come with occupation. So let there be no doubt: the situation for the Palestinian people is intolerable. America will not turn our backs on the legitimate Palestinian aspiration for dignity, opportunity, and a state of their own," he said. The U.S. "does not accept the legitimacy of continued Israeli settlements," he said, adding also that Palestinians need to change their approach and Hamas must put an end to violence. "Israelis must acknowledge that just as Israel's right to exist cannot be denied, neither can Palestine's," he said. The only resolution will be for Israelis and Palestinians both to live in peace and security, Obama said. "That is in Israel's interest, Palestine's interest, America's interest, and the world's interest," he said. Arab countries should also no longer use the conflict with Israel to distract their own people from other problems, he said. He added that the U.S. would align its policies with those who pursue peace. Engaging with Iran regarding its nuclear program is in the best interests of the world, Obama said, adding the U.S. is willing to engage in discussions without preconditions and on "the basis of mutual respect," he said. Iran has insisted its nuclear research is aimed at generating electricity but the U.S. and other Western governments accuse Tehran of seeking atomic weapons. "This is not simply about America's interest," Obama said. "It is about preventing a nuclear arms race in the Middle East that could lead this region and the world down a hugely dangerous path." Iran has a right to access peaceful nuclear power if it complies with its responsibilities under the nuclear non-proliferation treaty, he said. 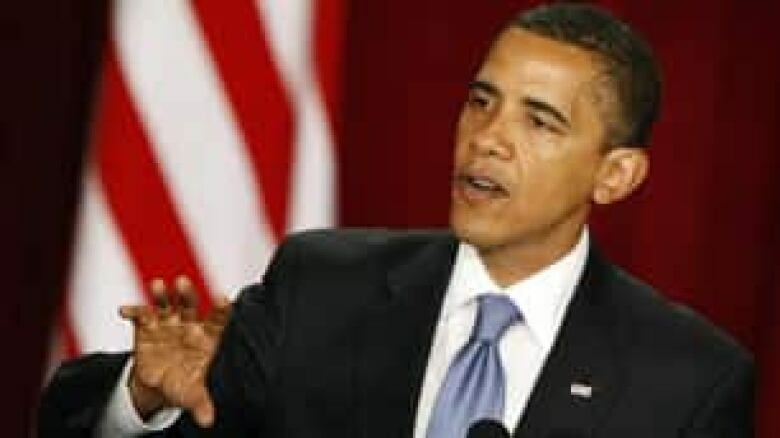 Obama's words have the potential to be instrumental in reversing some of the rifts between the U.S. and the Middle East, said Abdel Monem Said Ali, an Egyptian political analyst. But no new policy proposals were put forward in the speech, which drew criticism from some countries and leaders in the Muslim world. There were no surprises in Obama's comments regarding Israel, said Danny Seaman, director of Israel's Government Press Office. The Israeli government later released a written statement indicating that Israel remains committed to peace and its own security. Chief Palestinian negotiator Saeb Erekat said Palestinians "warmly welcomed" Obama's "declaration of Palestine" and a two-state solution to the conflict in the region. 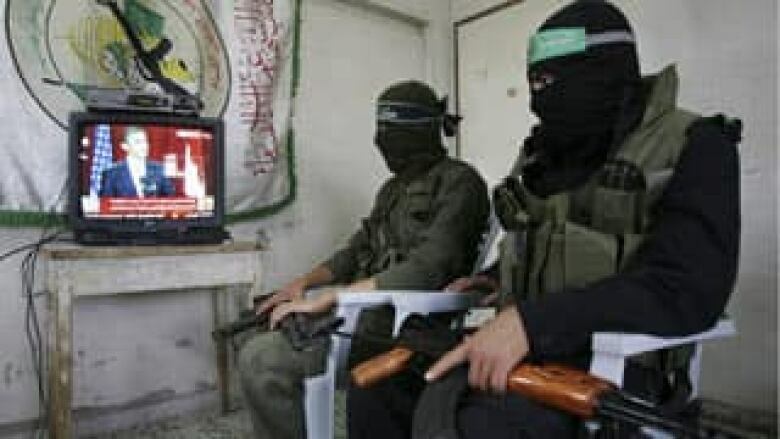 It's "a clear message to Israel that a just peace is built on the foundations of a Palestinian state with Jerusalem as its capital," said Nabil Abu Rdainah, the spokesman for Palestinian president Mahmoud Abbas. Mahmoud Ramahi, a legislator from Abbas rival Hamas, offered qualified praise for the speech. "There are many positive points," he said. "There is a difference between his policy and Bush's policy. I see a change in the U.S. foreign policy discourse. But the problem is still on the ground." Hassan Fadlallah, a legislator from Lebanon's Iranian-backed Shia Hezbollah group, called the speech a "political sermon," which "the Islamic world does not need." Officials in Baghdad welcomed Obama's continued commitment to withdraw U.S. forces by 2012 but said there was no information in the address that the country didn't already know. Obama arrived in Cairo after visiting Saudi Arabia on Wednesday. It is the second stop of a four-country trip to the Middle East and Europe. During the brief visit to Cairo, Obama also met with Egyptian President Hosni Mubarak, visited the Sultan Hassan mosque and toured the Great Pyramids of Giza. The tour is Obama's first visit to the Middle East since being sworn in as president. CITIZEN BYTES: Do you think Obama's overture will succeed and will it impact Canada?